Malaysian Software Testing Board (MSTB) is a national body representing the industry interests in promoting Software Quality Assurance (SQA) and software testing as core competencies in the development of IT-dependent quality products and services. 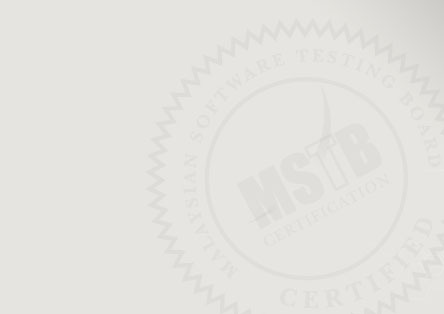 As a member of the International Software Testing Qualifications Board (ISTQB), MSTB regulates the accreditation and certification processes for Malaysia. The certification programs offered by ISTQB syllabus are built upon the best practices and collective testing knowledge contributed by the testing practitioners worldwide. Certifications offered by MSTB are Certified Tester Foundation Level (CTFL) and Certified Tester Advanced Level (CTAL) that are recognised in all member countries of ISTQB. Unlike some other professional certification, there is no requirement to renew one`s certification as it is for a life time. MSTB also offers the Certified Professional in Requirements Engineering (CPRE) through its partnership with the International Requirements Engineering Board (IREB), that provides the core syllabi and guidelines for accreditation and examination in requirements engineering. Among the MSTB initiatives is the Malaysia Software Testing Hub (MSTH) program, a strategic public-private partnership with the Government of Malaysia (GoM). The intent of the initiative is to pilot an eco-system that demonstrates the interest of different stakeholders involved and means that are required to ensure a sustainable model to support the MSTH in the future. The Malaysian Software Testing Board (MSTB) is pleased to announce that starting November 2018, examination for the Certified Tester Foundation Level (CTFL) will be based on the new syllabus – CTFL 2018 Syllabus. The revised syllabus was released by ISTQB in June this year and part of the International Board’s continual efforts to keep syllabi current in relation to changes in the software industry.